This lighthouse marks the southern entrance to the Sea of the Hebrides. The light station is located on top of vertical cliffs on the narrow western spine of Berneray, southernmost of the Western Isles. 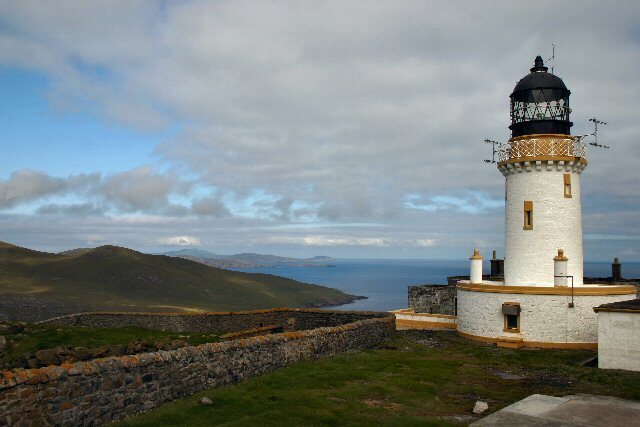 Although known as Barra Head lighthouse, it is actually situated at Skate Point, about a mile north-west of Barra Head. Robert Stevenson used local granite to build the lighthouse above Skate Point in 1833. A track leads to the lighthouse from the landing point on the north coast of the island. masonry tower with lantern and gallery, attached to a 1-story keeper's house. Lighthouse painted white, lantern black.